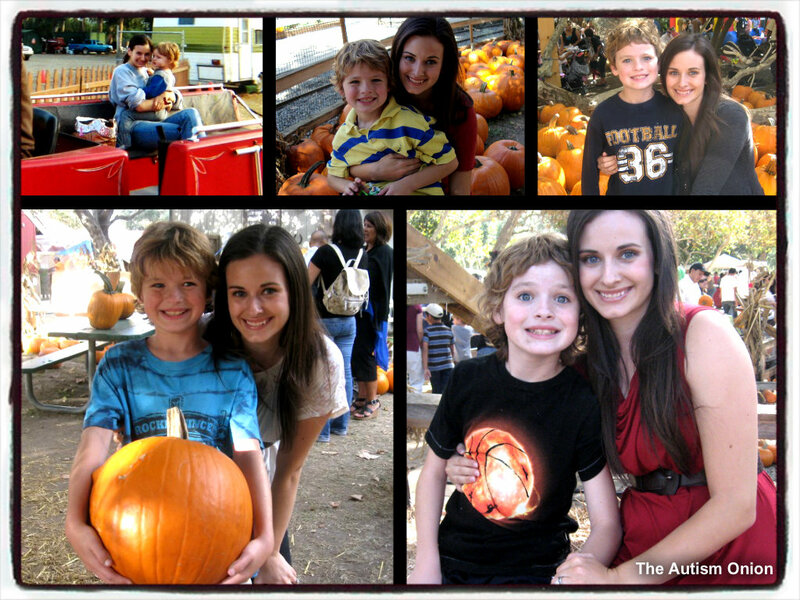 I’ve taken Dylan to the pumpkin patch almost every year since he was a baby. It’s one of my favorite traditions with him, and for the past couple years my sister joins us, too. Over the years we’ve been able to see his progress in our annual outings to the patch. I remember the year he kicked me in the stomach because he couldn’t have my water bottle, as an uneducated onlooker told her kid that he was “being a bad boy”. I remember the year he handled being told he was too big for one bounce house LIKE A PRO! He easily transitioned to a different bounce house for kids his age. I remember the year he appropriately used his words to let us know he was over it, and wanted to go home. I remember the year we tried taking him to a different pumpkin patch and he described the one he wanted to go to instead. I don’t think he looks forward to our yearly trips to the pumpkin patch as much as I do. But, I know that he counts on our routine. He wants the same pumpkin patch, to do the same activties (pick a pumpkin, get cotton candy, go in a bounce house, ride the train), and then he wants to go home. Plus, he smiles for pictures, even when his nutty big sis insists on taking about 1,000 😉 Our pumpkin patch trips are one of my favorite things about fall. I love our tradition, and I count on it every year.